In this side-scrolling platformer/shooter you level up your character by literally going up to the next level. Each level-up earns you some points to spend on upgrades: more health, firepower, new weapons, skills, etc. Also, it's made of voxels, so you can destroy walls and dig tunnels or trenches to hide from enemy fire. The full game will feature many levels and upgrades, and boss fights where you can blast holes in huge bosses to get to the vulnerable spots inside them. Finally, development of LEVEL UP! has been resumed ! The free demo can now be installed from Desura. It will be updated as the game is developed. A side-scrolling platformer/shooter you level up your character by literally going up to the next level. New version featuring generated levels and new graphics is released. Free demo is available for download. 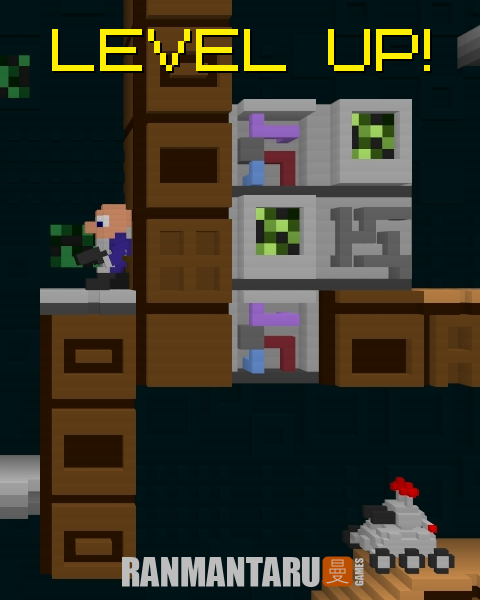 Installer for the 0.06 version of LEVEL UP!, adding few new features and several bug fixes. New demo featuring generated levels and new graphics. The first demo with two playable levels and few character upgrades. Hey, wasn't it a online game? I played it! LEVEL UP! 0.04 released on my site, Desura release should be available soon too. Main features: collectible bonuses (health and upgrade points), explosive barrels and new rooms. https://www.indiedb.com/groups/desura/forum/thread/level-up-name-taken -Forum post showing that this name is already taken and that you should change your name of your game. I really like what i see so far and feel this game has potential. The retro style graphics and music is a nice touch as well. I'm buying into it. I look forward to new content as it comes. I guess the next update will be in two weeks. I'm going to make levels more varied and add different enemies. Nice! Good to know. Out of curiousity, will there eventually be some kind of endless mode of randomly generated levels where it just gets progressively harder and the idea is to get as far as you possibly can on one life? Yeah, I might add such mode. The original ideas is to have a number of similarly themed levels (4 I guess), then a boss fight, then another set of levels, etc, until you reach the final boss.